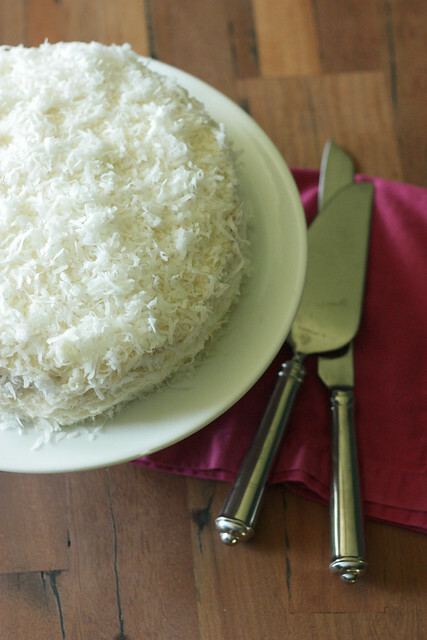 Coconut Cake – Elly Says Opa! I know that coconut can be very polarizing. And I must admit that there is often a fine line because THIS IS SO AMAZINGLY GOOD and THIS TASTES LIKE BANANA BOAT. This cake, thankfully, is in the first camp. Although the original recipe calls for Swiss meringue buttercream, I went with a traditional buttercream not only because I am terrified of making the Swiss meringue variety, but because Tom and I actually prefer the traditional variety. Another great thing about Tom choosing this cake is that there is no decorating involved. It is simply impossible for me to use a piping bag in a way that does not result in a cake looking like it was frosted by my 4 year old. This is just throwing a bunch of shredded coconut on top. I can do that. Adjust oven rack to lower-middle position and heat oven to 325 degrees. Grease two 9-inch round cake pans, line bottoms with parchment, grease parchment, and dust with flour. Whisk whole egg, egg whites, cream of coconut, milk (or water), and vanilla and coconut extracts in a large measuring cup. Combine flour, sugar, baking powder, and salt in bowl of standing mixer fitted with paddle attachment. Mix on lowest speed to combine, about 30 seconds. With mixer still running on lowest speed, add butter 1 piece at a time, then beat until mixture resembles coarse meal, with butter bits no larger than small peas, about 2-3 minutes. With mixer still running, add half of the wet mixture. Increase speed to medium-high and beat until light and fluffy, about 45 seconds. Add remaining liquid in steady stream. Stop mixer and scrape down bowl with rubber spatula, then beat at medium-high speed to combine, about 15 seconds. (Batter will be thick.). Divide batter between the prepared cake pans and level with offset or rubber spatula. Bake until cakes pull away from sides of pans and toothpick inserted into center of cakes comes out clean, about 25-30 minutes. Cool cakes in pans on wire racks about 10 minutes, then loosen cakes from sides of pans with paring knife, invert cakes onto racks and then turn them right side up again. Cool to room temperature. *If you are planning to toast your coconut, leave the oven on, spread the coconut on a rimmed baking sheet, and toast for about 12-15 minutes, stirring 2-3 times and checking on the coconut as it toasts. To make the frosting, cream butter in a mixing bowl on medium speed until light and fluffy. Add the extracts, and scrape down the bowl. Add 3 cups of sifted confectioners sugar, about 1 cup at a time, as you continue to beat the frosting. Beat in cream of coconut and 1-2 cups of sifted confectioners sugar. Adjust for taste and consistency, if necessary, by adding more sugar or milk. To assemble, place 1 layer on a flat serving plate (I like to put parchment or wax strips underneath that can easily be pulled out, to keep the plate clean), top side down, and spread with frosting. Place the second layer on top, top side up, and frost the top and sides. 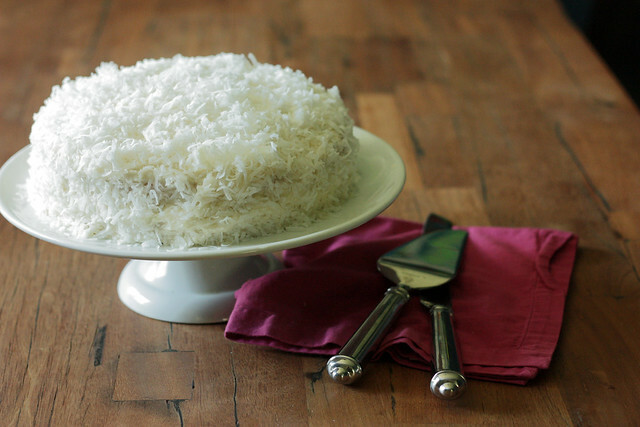 To decorate, sprinkle the top with coconut and lightly press more coconut onto the sides.